The next block we are going to add is QT GUI FFT Sink under Instrumentation tab. This one helps to visualize the frequency components. To connect the blocks, just click on the «out» of the Source and then on the «in» of the FFT Sink. USRP Source title changed color from red to black, which means that output properly connected with input of the next block. If QT GUI FFT Sink title is still red, then probably we have WX GUI enabled in Generate Options (top block). If we change that option to the QT, the FFT Sink will also become black. QT (http://www.qt.io/) and WX (https://www.wxwidgets.org/) just different libraries with graphical user interface elements. It’s necessary to increase sample rate in samp_rate variable to be able to register the GSM signal. 1 million would be enough. Let us also create another variable center_freq to be able to change the central frequency in one place. Now we can set center_freq in both blocks and change it in Variable block if needed. Our lab Base Transceiver Station (BTS) transmits downlink signals at 949.8 MHz and receives uplink signals at 904.8 MHz. 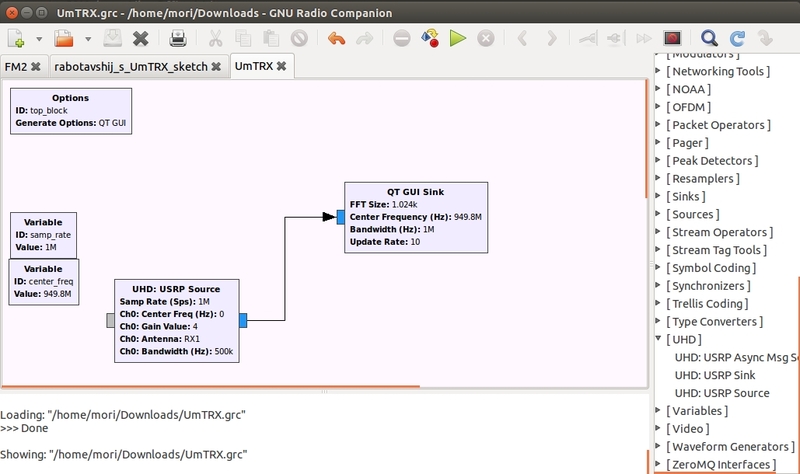 If you don’t know exactly GSM frequencies transmitted near you, you may scan them using GNU Radio uhd_fft tool or software like gqrx (http://gqrx.dk/). We will listen at 949.8 MHz first to catch some broadcast channel signals. Push «Execute the flow graph» button to catch some radio waves! Here it is! 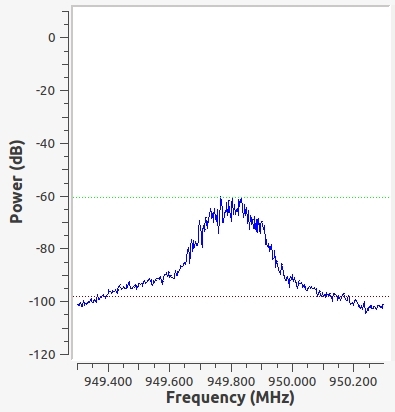 The downlink GSM signal at 949.8 MHz.